Managing virtual machines (VMs) is the core functionality associated with IaaS cloud infrastructures. StratusLab is no different, providing the commands to start and stop virtual machines. Users can define the resources allocated to these VMs–CPUs, RAM, swap space, and volatile disk space. Search the Marketplace for virtual machine image to run on the cloud. Launch a machine instance via the cloud entry point using the VM image identifier. Obtain the machine instance’s network address. Use and control the VM, usually for example, logging into the VM as root via SSH. Shutdown the virtual machine and release the resources. The detailed lifecycle of a machine is more complicated. The diagram shows the full lifecycle and describes what is happening behind the scenes in each of these cases. 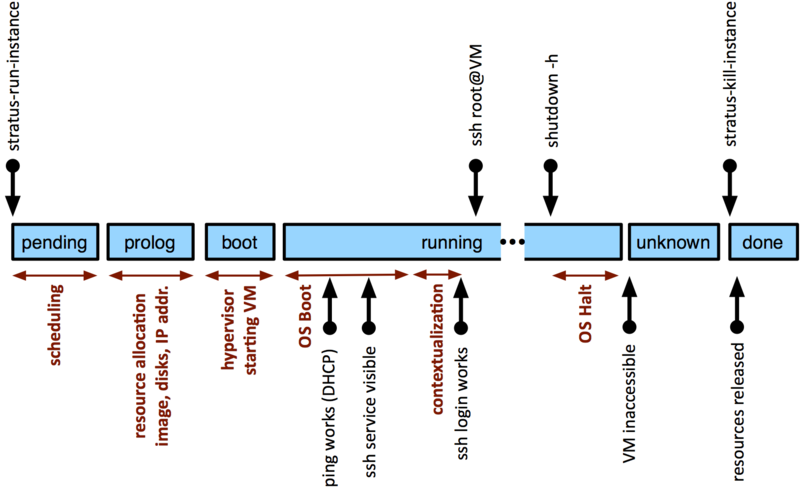 Virtual machine timeline and states. Probably the easiest way to see how this works is to run through a complete example. We will go through a complete lifecycle for a ttylinux machine. The ttylinux distribution is a small linux distribution mostly intended for embedded systems. Its small size and fast boot make it ideal for tests. First you would normally browse the Marketplace to find a suitable image. You can find the images provided by StratusLab by searching for the endorser “images@stratuslab.eu”. For our case, the ttylinux image has the identifier: “BN1EEkPiBx87_uLj2-sdybSI-Xb”. This provides the virtual machine identifier (165 in this case) and the IP address at which the machine will be visible. More details will be provided if you increase the verbosity of the commands with the options -v, -vv, or -vvv. More letters provide increasingly more verbosity. This is especially helpful when virtual machines fail. or you can use the command stratus-connect-instance with the VM identifier. This command is a simple wrapper around the SSH commands. To safely stop all services and halt a virtual machine, use the standard shutdown or halt commands from within the virtual machine. Connection to vm-201.lal.stratuslab.eu closed by remote host. The machine will stop and the status will eventually become an “unknown” state. This mechanism ensures that all resources (especially data volumes) are shut down cleanly and released. Note that the VM resources are not released until the stratus-kill-instance command is run. This is the essentially the equivalent of pulling the power cord out of a physical machine, so be careful when doing this, especially if persistent data volumes are attached to the virtual machine. You can select the configuration you want by using the --type option to stratus-run-instance and providing the name of the type. The default is the type marked with an asterisk (“m1.small”). You can also individually specify the CPU, RAM, and swap space with the --cpu, --ram, and --swap options. These will override the corresponding in the value in the selected type. Note that the maximum values are determined by the largest physical machine in the cloud infrastructure. The cloud administrator of your infrastructure can provide these limits.